Our Advent journey continues in The Way of Love: Practices for Jesus-Centered Life. Find at-home practices for Advent 2 here. 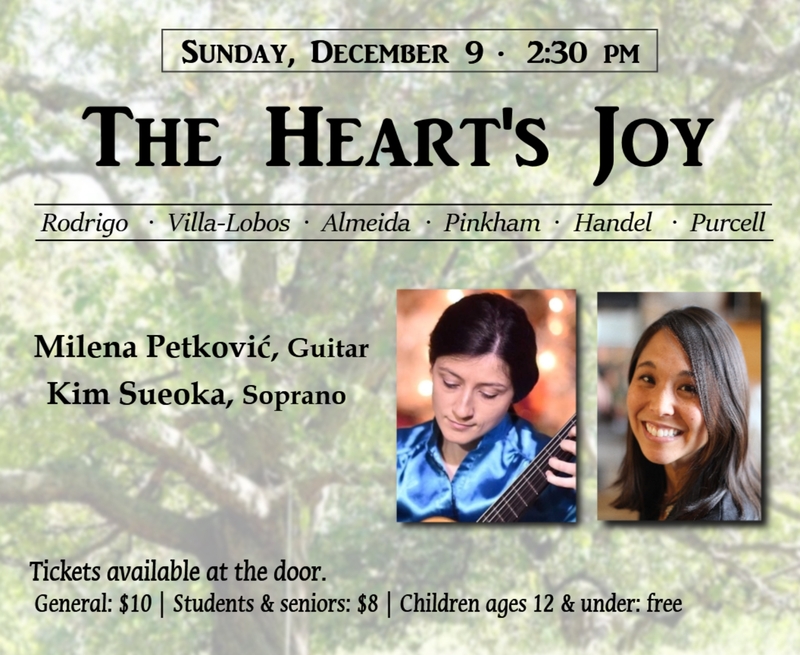 The Heart’s Joy: Songs for Voice and Guitar will be presented at 2:30pm featuring soprano Kim Sueoka and guitarist Milena Petkovic. Tickets sold at the door: $10 for general admission, $8 student/senior, and children 12 and under are admitted for free. WONDER Eucharist will be offered this Sunday (and each first Sunday of the month) at 3:00pm in the Chapel . Bring your littlest worshippers for a brief liturgy of stories, sacrament, and fun! December 16 – Southside Care Center’s gift tags for residents (and envelopes for staff gift cards) are on the Giving Tree in the Kellogg Room’s bay window. Choose a tag or envelope, sign up on the list near the tree, then bring back your wrapped gift with tag next week. Groveland and Joyce Uptown Food Shelves joyfully receive Saint Paul’s weekly donations. December’s theme is SOUP (cans, cartons, mixes, etc); they also have ongoing need of personal care products. Please bring items to church as part of your weekly offering, and place in baskets in the Narthex. We are also in need of volunteers to deliver donations each month; details and the 2019 sign-up can be found on the bulletin board by the Nursery.The Worship Committee will meet at 6:30pm November 29th to review this year’s goals, set 2019 goals, reflect on fall liturgies, and anticipate liturgies for the coming winter. Saint Paul’s Vestry is searching for candidates to serve two-year terms as Vestry members. The Vestry –the lay governing board of the church– works in tandem with the Rector to set the agenda for the church’s mission and ministry. We meet monthly, and each member also serves as liaison to a commission. If you a baptized member of Saint Paul’s Church, you are eligible and welcome to serve. You may speak to either Warden (Jacob McCray-Reeves or Meredith Johnson), Jill Westendorp, or Jim Huismann. I Believe! Stewardship Progress: Thank you to everyone who has submitted a pledge for 2019! As of Monday we have 47 pledge units in for a total of $148,412.56; this includes four new pledging units. We are still waiting for 21 previous pledgers to renew. If you have not done so or have any questions regarding your pledge, please contact our Finance Secretary, Brad Lien. The Vestry needs this information to form the budget for 2019, so the sooner we receive this information, the better. Christmas flowers and trees may be given with thanksgiving or in memory of a loved one. For inclusion in the Christmastide bulletins, please sign up on the sheet in the Narthex by 19 December to meet our printing deadline. Please print your thanksgiving or memorial on the memo line of your check. The Year in Pictures won’t be complete without your help! Do you have photos of yourself and other Saint Paulites participating in activities at church, or out having fellowship in our community? Email them to Angie to be included in our photo archive and possibly our 2018 memory video, which will debut at the Annual Meeting on 27 January (see announcement above). A Festival of Lessons and Carols will be offered to the community at 7:00pm. Please join us for a tranquil evening of music, light, and fellowship; details of this treasured Advent occurrence can be read here. In the Anglican Cycle of Prayer, we pray for The Reformed Episcopal Church of Spain. In the Diocesan Cycle of Prayer, we pray for the Minnesota Commission on Indian Work (MCIW), and for the Hispanic, Hmong, Liberian, Karen, and numerous multi-cultural ministries and faith communities throughout the Episcopal Church in Minnesota. We also pray for the parish of Saint Nicholas (Richfield).